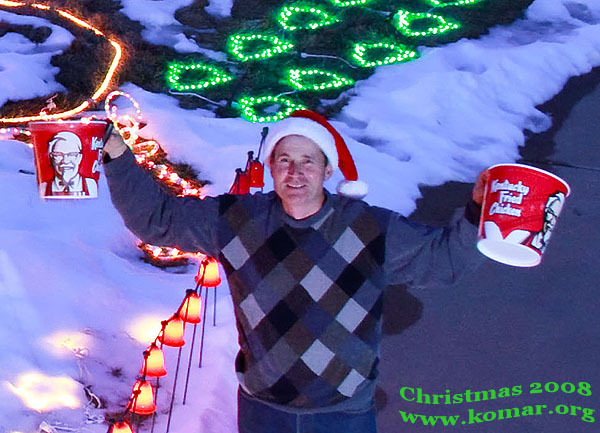 2008: Controllable Christmas Lights wins $1,000 for Celiac Disease ... plus free KFC for a Year! Alek Komarnitsky from the Republic of Boulder, Colorado is happy to be the winner of the 2008 Kentucky Fried Chicken Original Holiday Traditions contest (screenshot) - local newspaper article. 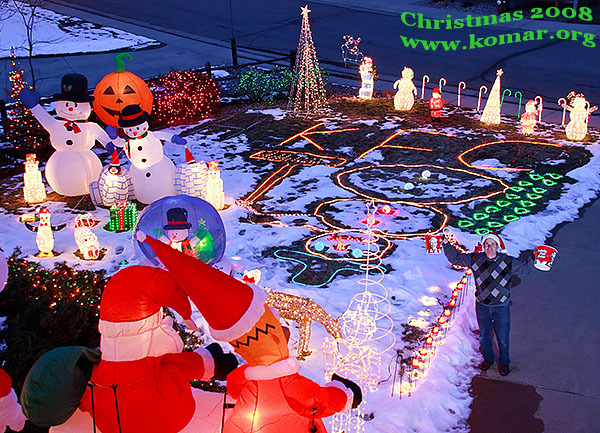 The Controllable Christmas Lights for Celiac Disease are an annual tradition on the Internet as over the years, millions of people worldwide (148 countries so far in 2008) have viewed the 20,000+ Christmas lights via three live webcams on the totally free, fun, and zany www.komar.org website. 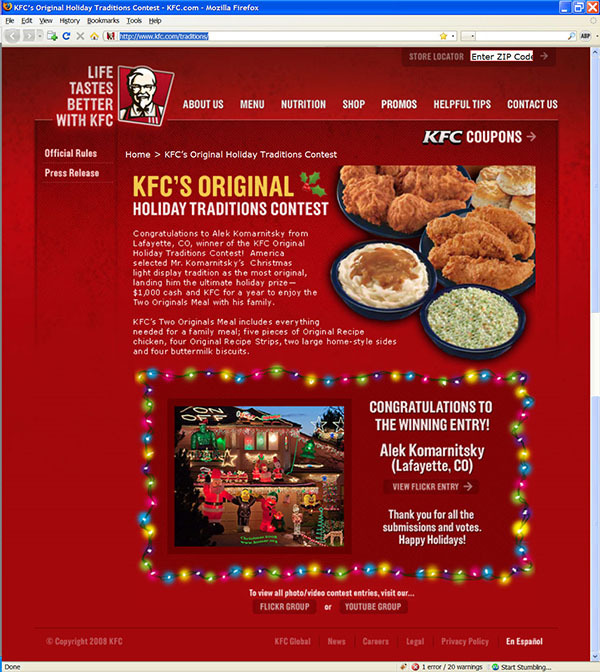 While Alek is tempted to use the $1,000 grand prize to buy even more Christmas Lights, he has asked KFC to donate the cash prize directly to the University of Maryland Center for Celiac Research which they appreciate. This brings the total raised so far to over $35,000 to help find a cure to benefit his two sons, Dirk and Kyle. 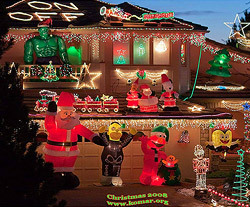 "Clark Griswold move over - a Lafayette family can now officially lay claim to the best Christmas Lights Display in the entire country"
Kentucky Fried Chicken is running a nationwide Holiday Traditions Contest and Colonel Sanders has selected the Controllable Christmas Lights for Celiac Disease as a semi-finalist. 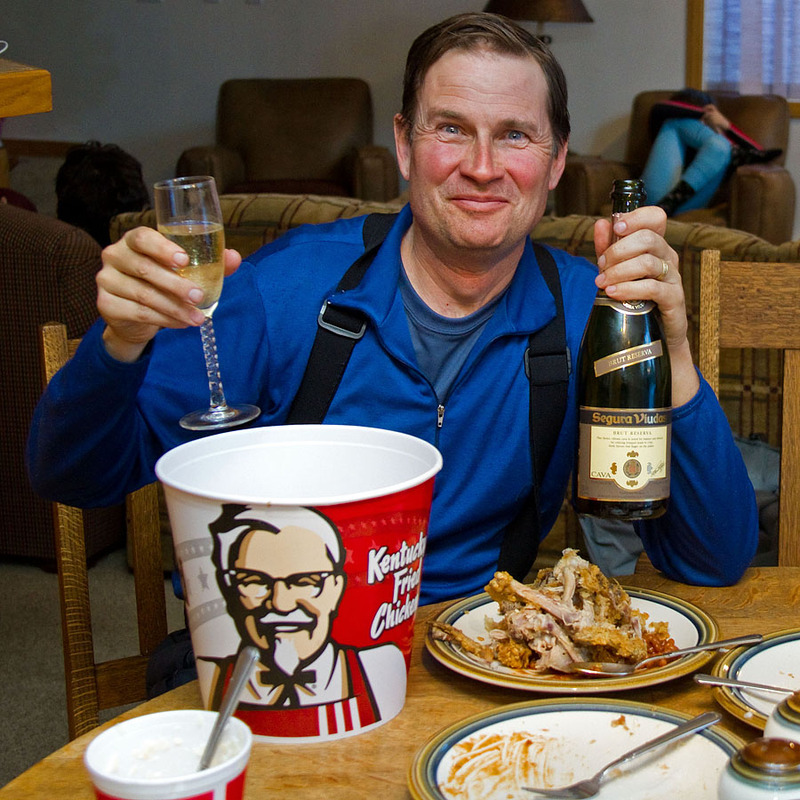 The winner receives an entire year of finger-lickin' good KFC chicken; Original, BBQ, or (my favorite) Extra Crispy - that's a lot of 15 piece buckets! 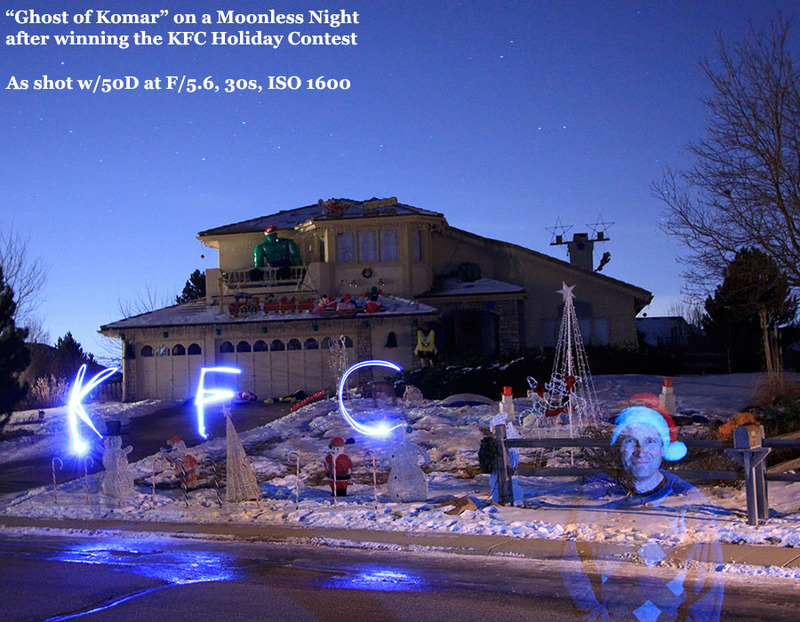 The winner also receives a $1,000 and while I'm tempted to use that to buy even more Christmas Lights, I will have KFC donate the entire amount directly to the University of Maryland Center for Celiac Research which my (crazy) holiday lights have already raised over $30,000 for to help find a cure. The contest winner is determined by Internet voting through December 21st, 2008 so please consider voting for my site and help win a $1,000 for Celiac Disease. So surf on by, tell your friends, blog about it, spread the word, etc. P.S. There were some issues with the contest voting site on Monday/Tuesday when my site was listed as entry #8, but if you voted for my site then, I've been told it counted. PPS. 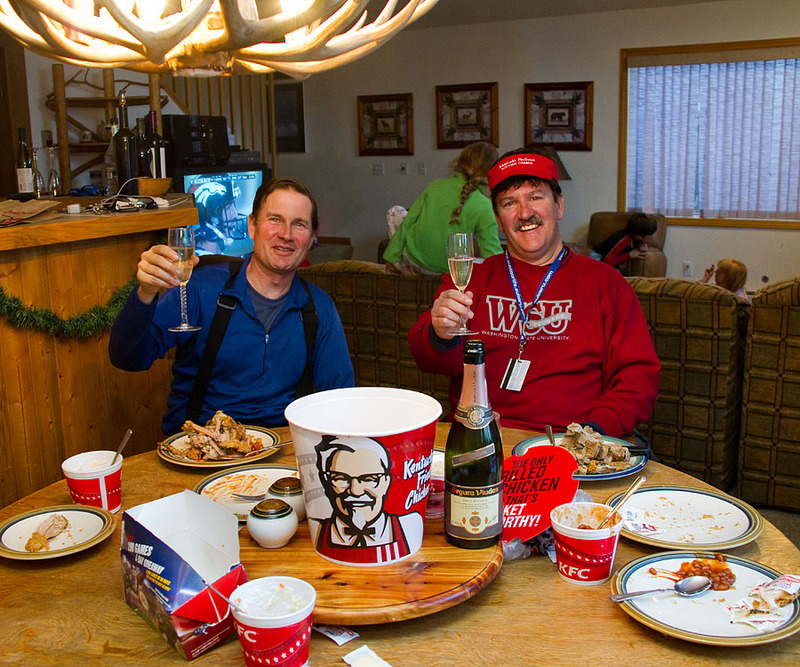 Numerous people have asked if they can vote more than once, but per the KFC Official Rules and Restrictions, limit one vote per person. Yes, I'm aware that other contestants have advocated cookie deletion techniques so people can cast multiple votes, but please do not do this as I would like to compete in this contest fair-n-square.